National Volunteer Week (NVW) is a time to celebrate and thank Canada’s 12.7 million volunteers. 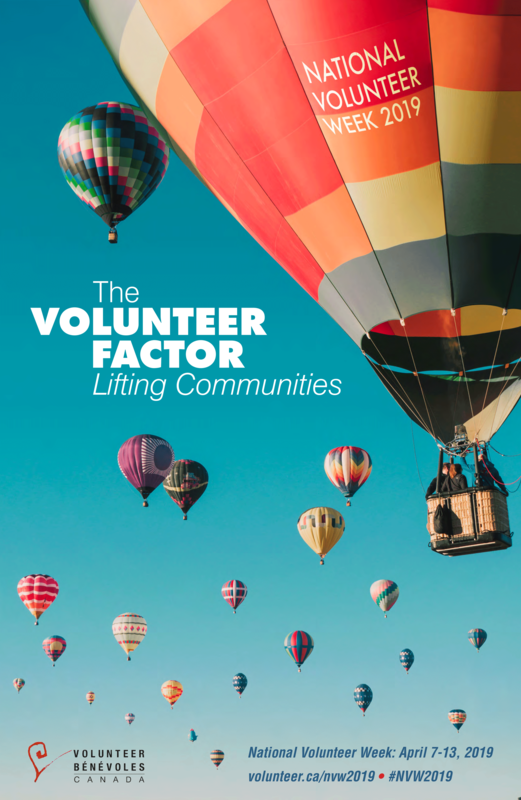 The Volunteer Factor celebrates and recognizes the exponential impact of volunteers and how they lift our communities. The beautiful image of the hot air balloons of different sizes, shapes and colours reflects the diversity of community volunteers. It illustrates that when people volunteer together, the sky is the limit, in terms of what they can achieve. Make sure to check out the NVW 2019 Campaign Kit, full of tips, templates and planning tools to help you plan your NVW events. Download the NVW 2019 poster! When we look at the 17 United Nations Sustainable Development Goals (SDGs) that Canada and others committed to achieving by 2030, there is not a single goal that does not involve volunteers. Whether working to eliminate hunger, promoting quality education or reducing inequalities. That’s the Volunteer Factor. Volunteer Canada would like to thank Loblaw for their support of NVW2019 and their commitment to SDG #2 – Zero Hunger. National Volunteer Week 2020 will take place April 19-25.